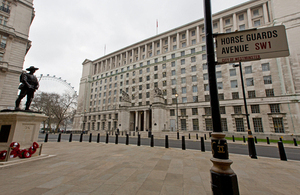 Personnel from all three Services will today be notified if they have been selected for redundancy in the second tranche of the Armed Forces Redundancy Programme. For many, selection will be a result of their own choice to apply for consideration to be made redundant. For others, it will be unwelcome. All notifications will be made either face-to-face or by telephone. Those personnel who will be returning to civilian life through redundancy will receive full support from their chain of command along with a comprehensive resettlement package to aid their transition. ** **See Related Links. Of course I regret that it has been necessary to make redundancies to deliver our plans for reducing the size of the Armed Forces. We inherited a multi-billion-pound black hole in the Defence Budget. We’ve now brought the Defence Budget back into balance for the first time in a generation. We will have smaller Armed Forces but we will ensure they will have the protection and equipment they need. The Royal Navy and RAF redundancy figures are smaller than anticipated due to the MOD’s ability to use other measures such as slowing recruitment. No further significant reductions are expected for the Royal Navy or RAF. We still have some way to go to bring the size of the Army down to 82,000 and decisions on what is necessary to achieve this are yet to be taken, but we won’t compromise the mission in Afghanistan. I would like to take this opportunity to offer my sincere thanks to those who will be leaving the Services for their contribution to our Armed Forces and to the nation’s security. Some of you may see redundancy as an opportunity. Others will see it as a significant challenge. Your chain of command will support you during the redundancy process, and I would encourage you to make full use of the comprehensive resettlement package as you make the transition to civilian life. I would also encourage those who are eligible to consider applying for transfer to shortage categories within any of the three Services. Applicants will serve up to six months’ notice before leaving the Armed Forces, while non-applicants will serve up to 12 months’ notice. Those who wish to leave earlier can ask their Service. Those selected for redundancy, and who meet the selection criteria, will have the opportunity to apply to shortage area categories. The Royal Navy and Royal Marines are notifying approximately 170 personnel that they are to be made redundant, of whom approximately 120 (72 per cent) are applicants and 50 (28 per cent) non-applicants. The Army are notifying approximately 2,900 personnel they are to be made redundant, of whom approximately 2,100 (72 per cent) are applicants and 800 (28 per cent) non-applicants. The RAF are notifying approximately 730 personnel they are to be made redundant, of whom approximately 515 (71 per cent) are applicants and 215 (29 per cent) non-applicants. All notification letters will set out clearly the next steps and explain where Service personnel can find further advice. This will be the last major tranche of redundancies for the Royal Navy, Royal Marines and Royal Air Force.